When 2 Soul Sisters were growing up, they were both passionate about different things. 1969, Kim was passionate about baby dolls. I was passionate about sports. Of all Kim’s dolls, I think Baby That-a-way was the most loved. Baby That-a-way was released by Mattel in 1974. On the Baby That-a-way box, it says “Getting into trouble, crawling to and fro…She’s the spunky little girl who’s always on the go!” Baby That-a-way was the most popular doll for several years. My passion was sports. 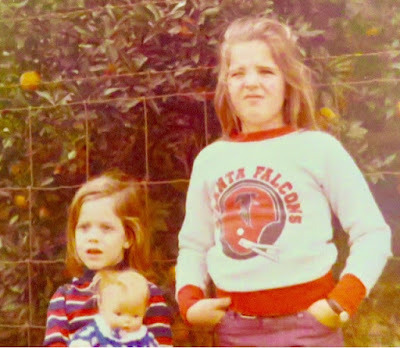 I was a Atlanta Falcon’s fan. On Sunday afternoons, I remember watching football on tv with my daddy. After the Falcon’s game, the neighborhood kids would get in the backyard and play football for hours (with Clint, Craig, Stacy, and Chip). I always wanted to be quarterback. I was inspired by the Falcon’s quarterback, Steve Bartkowski. He was a tall, good looking, and from Southern California. Bartkowski was drafted No. 1 overall in 1976 by the Falcons. He was the one to save the Atlanta Falcons. The Atlanta television shows broke into the Tonight Show with Johnny Carson to announce the news. What happened? Well, 5 games into the second season, Bart hurt his knee. The hopes and dreams of a Super Bowl team were tossed aside for many years. Today, February 5, 2017, I will watch the Falcons play for Super Bowl Champions. I will be cheering on Matt Ryan and his teammates. If only I still had my awesome sweatshirt from back in the day. Baby That-a-way and Steve Bartkowski have now gone down in history. I sure hope, today, the Atlanta Falcons will go down in history as 2017 Super Bowl Champs.